I think about earthquakes often, almost every day. That’s part of what makes a geologist — not just visualizing the deep past, but living in the deep present. Turning seeing into foreseeing. In this post I’ll talk about a bad idea, a good idea and a current lesson. The bad idea is that when the Big One hits, you’ll just saddle up your car and get clean out of town. Don’t count on it. There are two things wrong with this idea. First, the roads will be closed. 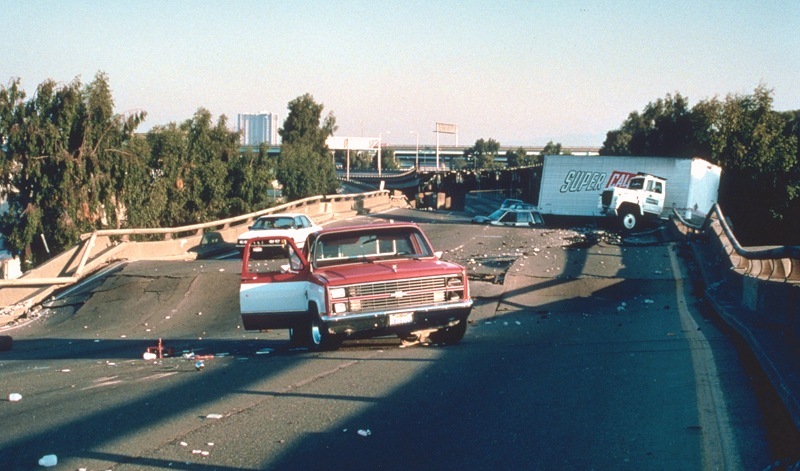 I can guarantee this, even if the freeways won’t collapse outright like the Cypress Structure did in 1989. They’ve all been upgraded. It’s not about the freeways, but about surface streets. Trees and live wires will fall in every neighborhood. Buildings will catch fire in every neighborhood. Roads will buckle in every part of town — because of landslides in the high hills and the low hills, because of ground liquefaction in the low lands. The authorities will open access in an orderly way. Be prepared to wait instead. Second, you should leave the roads clear for more important traffic — fire trucks, utility vehicles, police vans, ambulances. There will be hundreds of fires, broken water and gas lines, downed trees and power lines, a few panicky folks waving guns around, thousands of people injured. Sit tight and help where you can. It’s good to have your car equipped at all times, but don’t count on being able to leave fast, or soon. That stuff in the car will make a big difference regardless . . . like if you’re driving, not at home, when the quake hits. The good idea is this: text, don’t phone. Take a deep breath, sit down for a minute and use your phone’s little keyboard. With cell towers damaged and emergency traffic heavy, bandwidth for communications will be scarce. Voice traffic takes much more bandwidth than texting. Text one family member and have them inform the rest. They’ll already know you’ve had a big earthquake. Tell them what they really need to know about you. Don’t send video, don’t send audio. Save your battery. The current lesson is from the tragic Ghost Ship fire. It was reported in Thursday’s East Bay Times that people have raised a lot of money for the victims, more than $2 million, but six weeks after the fire, most of the funds haven’t yet been spent. Crowdsourcing drives feel fast if you’re donating, but getting the money at the other end takes a while. Read the article for a taste of the problems — psychological, bureaucratic, logistical — that make disaster relief hard work even for trained professionals. And this is for just one building fire with a few dozen direct victims. After the Big One the challenges will be orders of magnitude greater. Along with the red tags everywhere, there will be red tape. I don’t say all these things to dishearten or paralyze anyone. The best way to prepare is persistently. Pick one simple, specific, achievable step. Put that on your to-do list, then check it off, then add another thing. You might decide to put some extra cash in your go-bag and keep it there. At the same time, think about what you’ll need even more than money if it all falls down. To help with that, Oakland’s own Earthquake Engineering Research Institute has an updated “big one” scenario for the Hayward fault. This entry was posted on 16 January 2017 at 8:02 am and is filed under Earthquakes. You can follow any responses to this entry through the RSS 2.0 feed. You can skip to the end and leave a response. Pinging is currently not allowed. Also remember that if you have to cross a bridge or go through a tunnel to get to work then you should plan on being stuck there (away from home) for at least a day or two. Even if the bridges and tunnels aren’t damaged they will have to be inspected carefully before reopening after a big earthquake. Your excellent emergency kit doesn’t matter if you are in SF or Oakland and it is in Concord. I was thinking about this exact thing when a small landslide started up on Charing Cross Road two weeks ago. That is just a one lane road in most places, and people up in the hills would have one less way out if they needed it.